Loyalists were people in the Thirteen Colonies who opposed the American Revolutionary War. They were also called Tories. They fought with the British against the Continental Army and Continental Congress that they felt was oppressing them. In many areas, Loyalists were treated very roughly by revolutionaries (who often called themselves "Patriots"). Tory lands and other properties were taken away, and sometimes they were put into jail or even killed. Some formed militias, fighting along with the British Army against the rebels. After the war, many Loyalists sought asylum in Canada to escape the new United States and to stay loyal to King George and the British Empire. 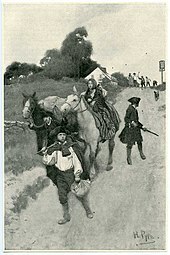 About 100,000 Loyalists left the country, including William Franklin, the son of Benjamin, and John Singleton Copley, the greatest American painter of the period. Most settled in Canada. Brantford, Ontario for example was started by Iroquois refugees. Some eventually returned, although several state governments excluded the Loyalists from holding public office. Most of the Black Loyalists left, as they faced re-enslavement if they remained in the USA. In the decades after the Revolution, Americans preferred to forget about the Loyalists. Apart from Copley, the Loyalists became nonpersons in American history. This page was last changed on 27 December 2018, at 21:23.